A two-track path created by four-wheeled wagons drawn by draft animals such as oxen or horses. The wheels created two ruts, marking routes that other travelers could follow and that left traces over the landscape that could be read for centuries. Travelers in wagons would often follow routes already created by indigenous peoples, appropriating traditional travel ways that had been previously used for trade and pilgrimage. 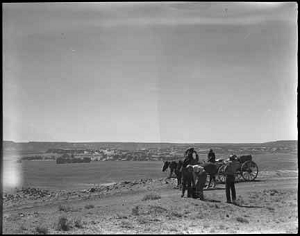 "Horses and wagon on the road to Acoma Pueblo, New Mexico," photograph, T. Harmon Parkhurst Collection (001932). Palace of the Governors Photo Archive, New Mexico History Museum. All rights reserved. Use with permission only. to the City of Angels. Reno: University of Nevada Press. Expansion. Williamsburg: Early American Industries Association.